I am super excited to share this recipe as a follow-up to last week's Everyday Veggie-Loaded Ragu share. 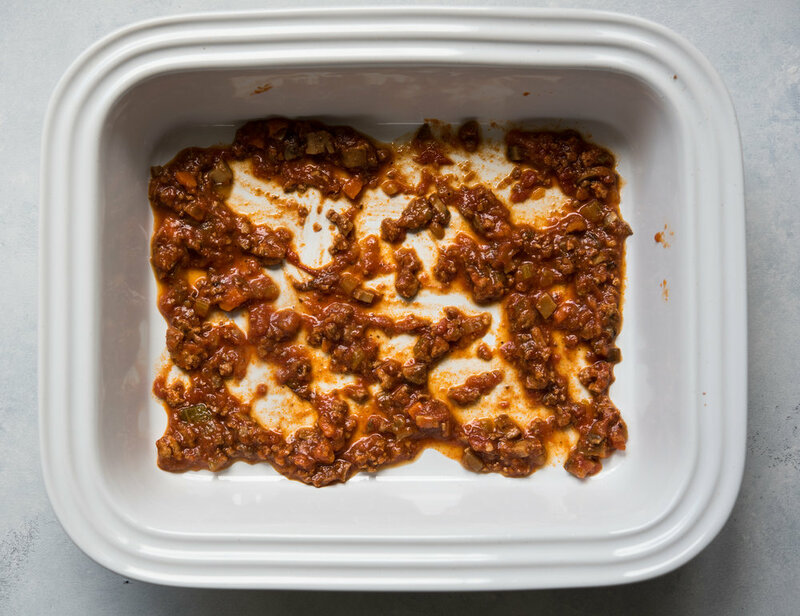 For forever, it was a no-brainer to make a lasagna later the same week I make up a big batch of my go-to ragu. I literally don't know a single person who doesn't like lasagna, do you? But when we began limiting dairy and gluten consumption (among other things) at the end of 2016, it seemed our lasagna days were over. Since December 2016, I have been on an endless (sometimes frustrating) quest to find new things we can eat, to replace all of the things given up at the family dinner table. Things such as cheese and cream and pasta - aka the ESSENTIALS in a lasagna. Luckily, I made a life-changing discovery of using nuts as a dairy / cheese substitute. It does sound super weird, but it has actually been used this way (by vegans in particular) for years. Soaked to soften and blended with water, nuts (such as almonds, cashews, macadamia, etc) can be transformed into a smooth and velvety consistency that is surprisingly and delightfully creamy. My friends are most likely tired of hearing me rave about how much I love (am obsessed with) nut milks and my nut milk coffee creamer. 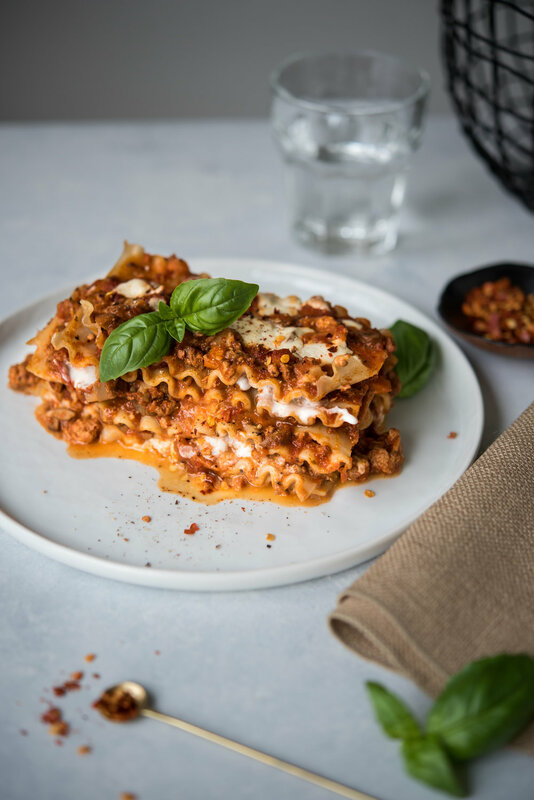 The 'cashew béchamel' in this dairy-free lasagna is a thicker nut milk ("cream") used in place of the cream-based béchamel sauce and melted cheese in traditional lasagna. 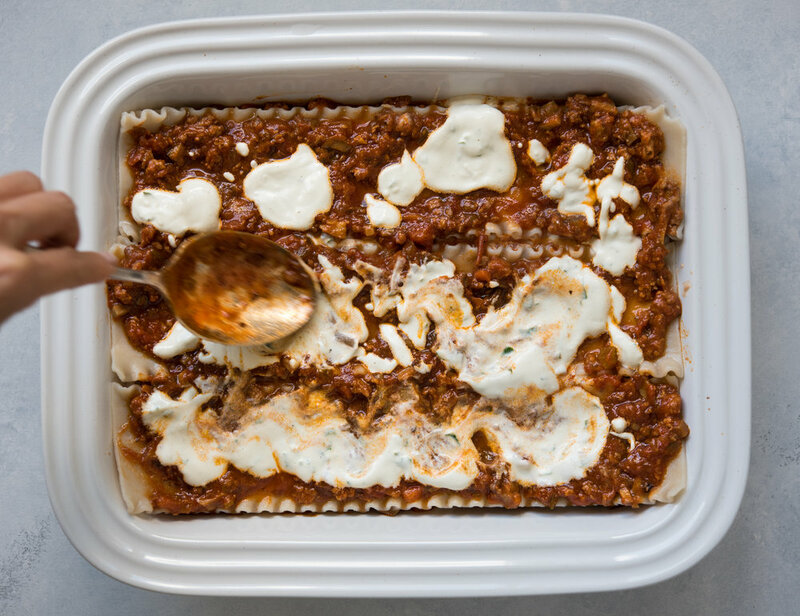 It lends a luscious creaminess to the lasagna that would otherwise be missing in a dairy-free lasagna! I also found a fantastic brown rice lasagna noodle to make it gluten-free too! c. this version is as scrumptious as the 'real deal'. Well you know what they say. In multiple choice, the answer is always c. Whether that is true or not, this version has in fact become 'the real deal' lasagna in our house. Try and let me know if you agree! CASHEW CREAM can be made in advance and stored refrigerated in a tightly-covered container for 5-6 days. BAKE FROM FROZEN: Lasagna can be assembled and frozen. Use an oven-safe, freezer-safe dish and tightly wrap it up. I like to put a layer of foil followed by one or two layers of plastic wrap. Label with content and date. 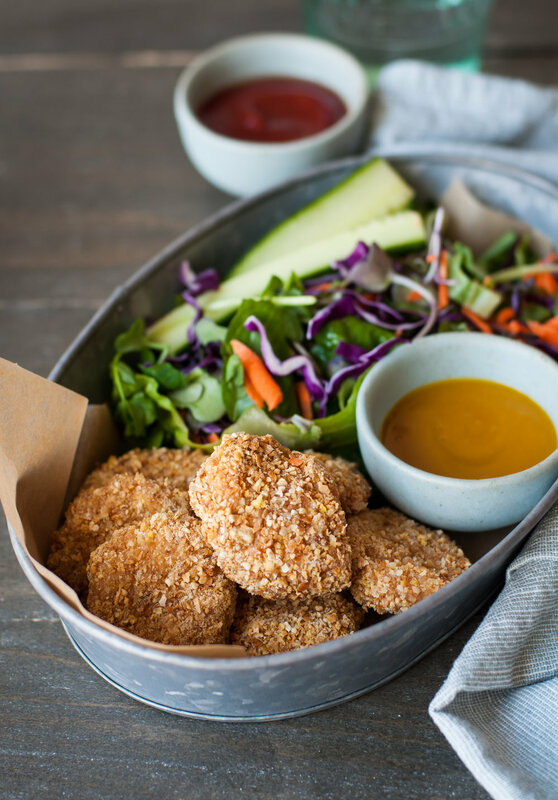 It can be frozen for at least a month or so and reheated directly from the freezer in the oven. Remove the plastic wrap layers and loosen the foil layer so that it forms a loose tent. Bake until the filling is completely heated through and sizzling (a meat thermometer inserted in the middle should read 165f). This may take 60 minutes or more. For the last 10 minutes, remove the foil completely so the top can get a nice brown. VEGAN VERSION: Sub in your favorite veggie pasta sauce instead of meat ragu. Recipe makes one 8" x 10" lasagna or serves 4-5. 1. 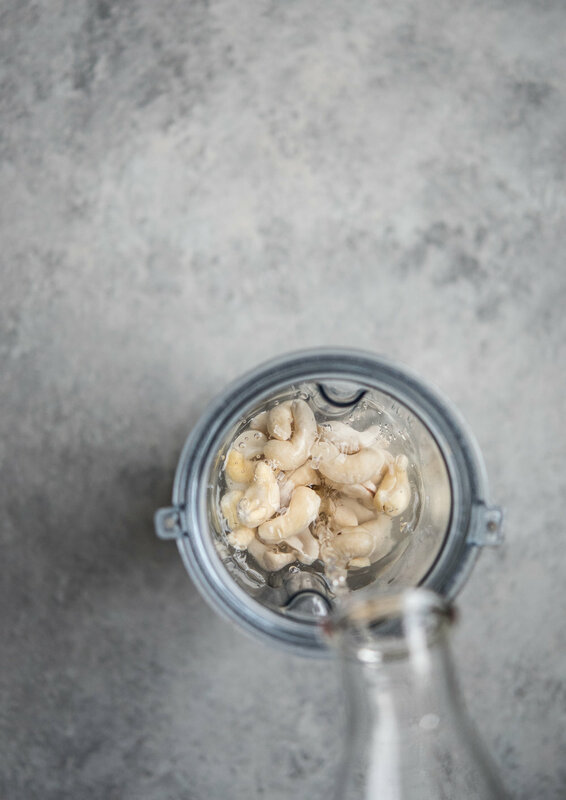 Soak cashews with approximately double the amount of water for 3-4 hours or overnight, whichever is more convenient. Drain and rinse very well in fresh water. Place in blender with about 3/4C fresh water and the salt and blend until smooth. 2. Preheat oven to 350f. Boil lasagna noodles according to package instructions but under cook at least 2 minutes or so since lasagna will be going into the oven. You may want to do the noodles in batches depending how large your pot is. Drain and lay not touching each other to avoid sticking (I park them on a large wooden cutting boards). 4. Bake the lasagna for about 30 minutes or until thoroughly heated through and the top is just starting to brown. Allow it to sit a few minutes before cutting and serving.